Maybe you have realised that I stopped numbering the days into the trip. When I was totally immersed in a 3 week journey, the number of days that went past seem insignificant. I cannot imagine if I were to embark on my belated gap year trip next year, I may simply forget the time to return home, when the only limiting factor was not time but money. "$1,000 left to the end of my trip" instead of "10 days left to the end of my trip." Money can always be earned again but not the time wasted not pursuing one's dream during the finite time we have on Earth. There, that comes the oxymoron that one need time to earn money to pursue your dream (if it requires money). It was half way during our trip at Khao Sok National Park, that we began planning the route back. From that point onwards, we have a schedule to keep, not more "This place is nicer than we thought, let's stay for a few more days." We sighted this statue from afar, and Ah Weng signalled to pull over. Another one of our stop over. A intricate and vibrant temple next to the statue. Postcard worthy? Sighting of limestone karst hills became more frequent as we near Krabi. We had only 2 nights in Krabi. Sharon and Weng visited one of its 'nearby attractions', Emerald Pool last year. There is crystal clear blue water which almost seem potable. 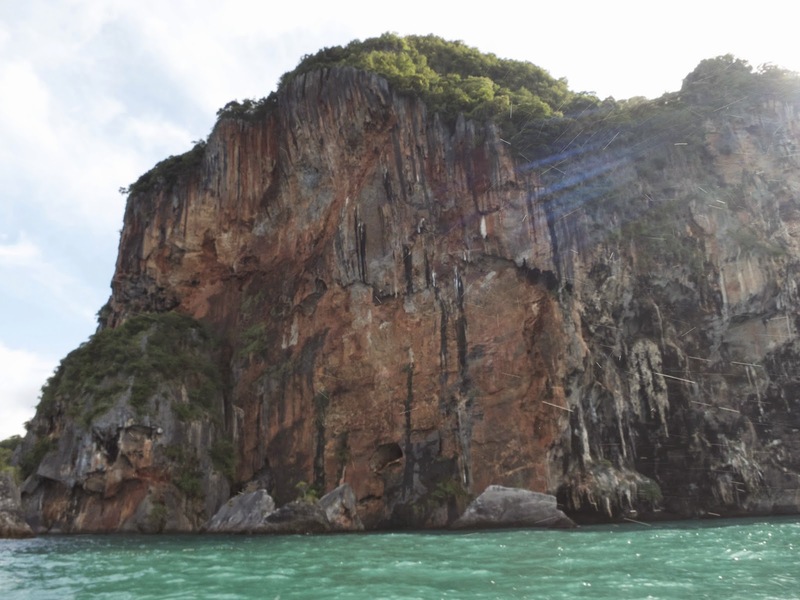 We only had one complete day in Krabi and to spend a few hours travelling to and fro the Emerald Pool, leaving Krabi unexplored, is not the best utilisation of our sojourn in Krabi. We checked into the first accommodation we see in Ao Nang, Aonang Sunset Hotel. There is a massage parlour and a pool. Managed to bargained the price to 1600 baht a night for 3 pax (around S$20 per pax), breakfast included. "What do you want to do tomorrow?," Weng asked. I had no clue. He directed me to a brochure rack at the hotel lobby. My fingers skimmed over the papers and picked up a few to browse. Snorkelling, scuba diving, island hopping, top rope climbing. I had enough of the sun, my limbs were already bitone because of my inadequate effort to cover myself or expose myself. Top rope climbing then! Sharon and Weng were not keen on that so I went alone while they explore Krabi. I thought I should leave them for some husband-wife-bonding time too. I have been a gooseberry for too long. Parking just right in front of the reception area. Decided on the full day top rock climbing session, I made arrangement with the receptionist. There will be a pick up tomorrow morning to the place. The rock climbing site is at Raileh beach, a pennisula surrounded by mountains. Although it is linked to the mainland, the only way accessible to Raileh Beach is by ferry. We started off with this wall which was easier. A young boy on the ropes. I have done indoor climbing before but outdoor top rope climbing is my first. The tenacity onto the wall no longer relies on man-made holds which are obvious to spot, I had to find and grapple any natural hold that can help me ascend. The holds are nooks and crevices scattered all over the limestone walls, of which some are quite uncomfortable to grab. I used to love climbing structures at the playground, shelters and monkey bar as a kid. Built really strong arms for a 12 year old, able to pull off 5 pull-ups and clinching best performer for inclined flexed arm pull up in school. In the past, fitness was a game, kids challenged how many times you can climb the monkey bar. Now fitness is, "No time la," "Tired la," almost like a chore. This climb served me as a gruesome reminder how far my fitness has declined and weight has increased since those days. My arms and thighs burn so easily! I got to acquaint with the other climbers as we chatted over lunch. There were two boys from Korea, Borack and Jae Sang, Yuki and Ryosuke from Japan. Yuki was the only other girl in the group for the full day course. As my company was going to send me to Japan for a study trip, I had to pick up Japanese. So I try to practise my half-past-six Japanese with her. Despite our slight language barriers, Yuki and I clicked really well. I wish I had a stool or ladder to start this one off. I was clinging tightly and dangling horizontally before I get to the vertical part. More bruises on my knees. I will wear a capri pants for rock climbing in future. I got to know other climbers over lunch. In my group, there were Jae Sang and Borack from Korea and Yuki and Ryosuke from Japan. Yuki and I had quite a lot to talk about. We really clicked. Yuki works in the Japanese International School in Bangkok. She has been living Thailand for sometime, so she speaks some Thai as well. I would later meet Yuki and Ryosuke again in my other travels. The world is so small! Borack had this really cool gadget that I had never seen before. (Many have seen it by now.) It was the selfie monopod. He bought it for only US$1. You see now how the demand and popularity had drove its price up to S$20. He managed to take selfie shots with his POV camera while dangling high up by the rope. As we travelled down south, the occasional sights of Buddhist temples got slowly replaced by sights of Mosque. More women are wearing hijab, evident of Muslim majority in this region. Satun is province in the most southwest of Thailand bordering with the Malaysian state of Perlis. The sleepy town is pretty unknown and untouched by tourist. There is not much attractions in the town itself but travellers can access to a group of beautiful islands in the Andaman Sea or transit to Langkawi, Malaysia from their ferry terminal. Survivor: Thailand was filmed in one of the islands, Ko Tarutao. 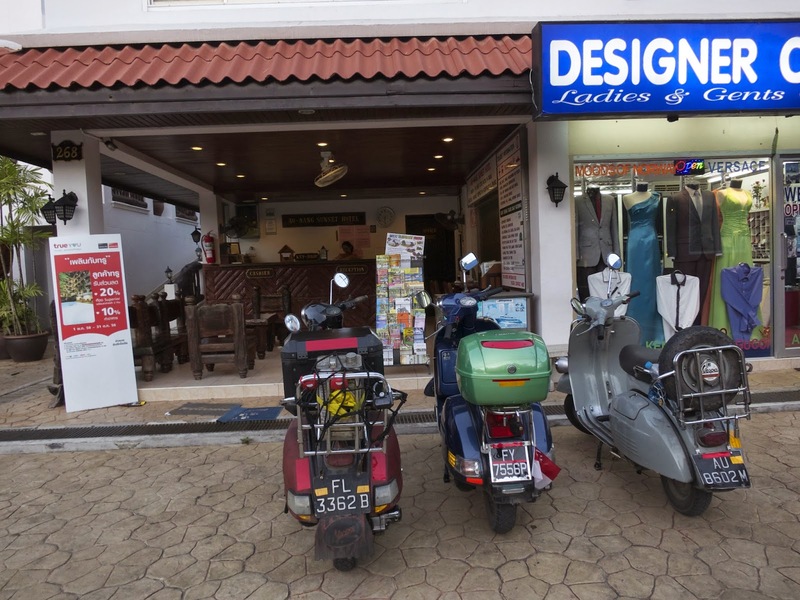 Locals usually stop over in this town before crossing border over to Malaysia. There were very few accommodations there. There was only one lodging along the main road 406, Pinnacle Wangmai Hotel. When I first enter the hotel, I found the place very dark. The atmosphere there was almost creepy if not for the guests waiting at the reception area. Weng later pointed out to me the talisman that was pasted on the wall. We did not think too much of it since we are only staying for one night. Otherwise, I would prefer staying at guesthouses but they are not that accessible. The elevator was dodgy. Not sure if it was a bid to save electricity, the lights in the corridor to our room was not switched on. The corridor was dimly lit by sunlight penetrating through a few windows. A few rooms away from ours, a guest left his door open, sitting there with some smoke enamating, not sure if he was smoking 20 sticks of cigarettes or starting a BBQ fire. We just whisked to our room. Whether you believe it or not, conclusion, the hotel felt downright creepy and dodgy! It was only one night, thank goodness. If you do not mind the location, I would recommend this other guest houses in Satun. The full moon that night added on to the atmosphere. 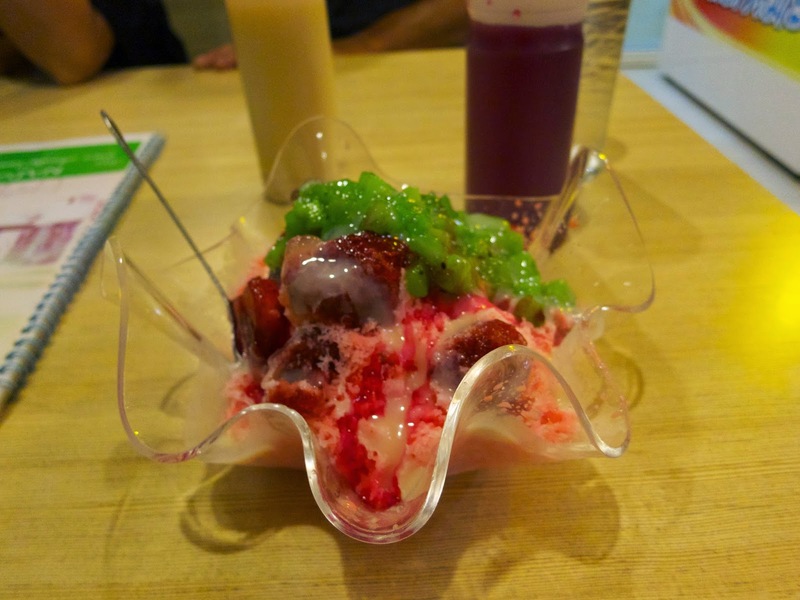 We explored the town that evening, visited the mall and the night market. I could hear Malay spoken here and some of the signs here were in Malay as well. We were enjoying desserts at a small cafe. A little girl came over to my table and gave me a small rat keychain. 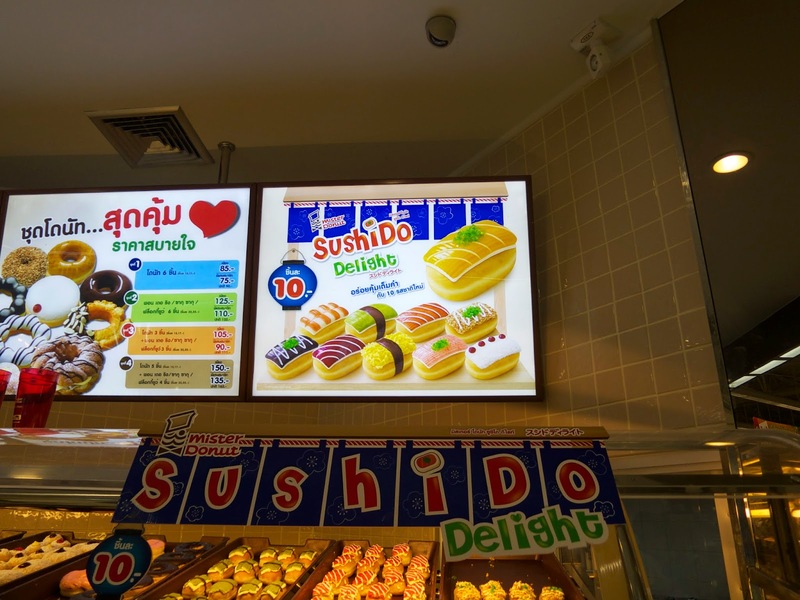 When you fuse donut and sushi, you get sushido. The next day we made our way to the Wang Kelian border which is around 40km away from the hotel. On Sundays, the border is open for the huge market on both side. Visitors can cross the border checkpoint without showing their passport within 1km of the market. Beyond those mountain is Malaysia. Spotted this unusual duo at Amazon Cafe. They were inseparable. The custom checkpoint, not as bustling as the one in Sadao. When you exit Thailand, you have to return the Temporary Vehicle Import Permit at the checkpoint and write your details in the logbook at the counter. Failure to do so will result in fine on your next border crossing with your vehicle. Just a few more metres away from Malaysia. The market which is thronged with people on Sundays. We are back in Malaysia! Alright up next stop - Penang!